Updated June 2012: with regrets, an attempt to update shortly after original post did not apparently take. Update via this Statement: I wish everyone to understand concretely, that the Amero Currency shown is part of a series of fraudulent PhotoShop efforts by a disinformation site (Federal Jack) which has repeatedly offered fake Amero and fake (edited) news stories in what seems an attempt to blur the truth to the favor of government. Their site is aptly named. A group of strangers, each top notch professionals in their various fields, are recruited quietly amid protest and assembled, along with a small military unit, at an abandoned railroad station where a special but ordinary looking train awaits. They learn MTSR-7 is one of seven trains operated by the Department of Defense, made up of custom railroad cars disguised to be ordinary looking, but which serve as a Mobile Tactical Situation Room. Intended to thwart nuclear and biological attacks on fixed sites, MTSR-7’s civilian and military occupants will become analysts who track and study mountains of intelligence data in deadly earnest to attempt to prevent, and if need be, manage an impending national security crisis. Their project is called Lion Dance, which is explained as a style of Chinese dance, and is the code-name for a potential conflict with Red China which, they learn, looms on the immediate horizon. “Seen from the changes in the World situation and the United States’ hegemonic strategy for creating monopolarity, war is inevitable. We cannot avoid it. The issue is that the Chinese armed forces must control the initiative in this war...” Chinese Defense Minister Chi Haotian as quoted in Hong Kong’s Cheng Ming newspaper in January of 2000. Red Chinese military constructing bases in Mexico, including near U.S. Border with 10,000 armored vehicles? I sure hope someone was snorting dope. The Canamex Highway is something vey few Americans know about or fully understand, thanks to a controlled media and secret corporate dealings, including bribes and blackmail of politicians. That and covert international agreements undertaken without Congressional knowledge or approval by the leaders of the U.S., Canada, and Mexico, all under the flag of the Security and Prosperity Partnership (SPP), which was the springboard for Canamex and what many fear will become the North American Union. SPP.gov, the government’s own site established to fend off cries of fowl play (translation: it is propoganda). Well, after Ron Paul and others showed it to be full of inaccurate statements (that’s being polite for disinformation and lies), they seem to have taken it down as of this post date. Wikpedia, which seems to parrot the official favorable descriptions such that it was likely originally defined by SPP proponents, and which itself also states that SPP was cancelled in 2009, at the height of the debate over the truth. Lou Dobbs Journal (a 2007 YouTube) tells it like it really is on national TV, and starts to open people’s eyes. When you tell people about it, they don’t believe you. Even government leaders, despite limited mainstream media exposure until just recently, frequently denied it was true (it was, after all, done outside of and without consultation with Congress by the Bush Shadow Government ~ a term I use in my book series, Fatal Rebirth), and were shocked to learn otherwise by means of hard evidence, such as one of the official Web sites and official documents leaked by Wikileaks. Ask Presidential hopeful Ron Paul, who was criticized endlessly by other Congressional Members and media for speaking out (YouTube vid) against something ‘which just isn’t true.’ Sadly, I fear his tough pro American, pro sovereignty, pro Constitutional stance will ensure his downfall in any election, even if it takes a bullet. They tried to kill Ross Perot when he gave it a try… but very few people know about that, because you weren’t supposed to know about why he dropped out of the election at the last minute. Well I knew, and knew about it in advance, and tried to warn him and the Secret Service. It may have saved his life, but it cost him a place on the ballot… and cost you and I the right to vote for him if we wished. It also cost me five years of being targeted by the Secret Service every time a President visited nearby. And, oh yes, it was privately acknowledged by Secret Service to involve mailed anthrax of the same military grade as used in Washington, D.C. some years later. Same stuff was also earlier being sold illegally to combatants in the Iran/Iraq War, there having been a CIA front established in Canada with money provided in part by Hillary Clinton (per two NSA retirees as documented in my book series, Fatal Rebirth) which would have been the logical delivery path. How interesting. Military-grade anthrax from U.S. Army depositories used to shape an election, and later to intimidate Congress into signing the Patriot Act(s). Hmm… Election by chads and death threats, and rule of law as well. Charming political system, eh? Republicrat dog and pony shows (‘…pray we don’t get fooled again. Meet the new boss. Same as the old boss.’) or nothing. I’d rather have nothing. The Who knew what they were singing about, why don’t we ever seem to get it? But Canamex and SPP is true, and that reality has finally has hit home amid heavy mainstream media reports of President Obama’s green light signature confirming the reality. It had already been in place, and is now about to go on line; a vast road and rail network sponsored by Globalist corporate interests and corrupt politicians was, secretly at first, and later more openly, conceptualized and plotted in what many fear is a key stepping stone toward a North American Union where the United States, Mexico, and Canada are no longer independent sovereign nations with their own currencies and militaries. The question is, if SPP and Canamex (bad enough) are true, then what of the NAU – the North American Union? How many Amero’s will you be paid for minimum wage, we might well wonder? UPDATE Aug 13, 2001: Images of ‘Ameros’ leaked <– CLICK!! Or will you be out of work because of a flood of migrants and a worsening economy? To whom do you pledge allegiance as citizen, and whos’ laws do you swear to uphold as soldier? To whom do you report a crime as traveler when portions of the highway are to be deemed Mexican and or International territories? Interpol? The Mexican Military? Smith and Wesson? The Highway is intended to allow Pacific Rim nations to stop shipping goods into the United States via American Western Seaports, and to instead ship them to newly constructed super ports in Mexico, save those shipments intended for final delivery in the Western States. This would effectively gut the maritime industries and curtail port activity and employment by some 70-80% in California, Oregon, and Washington, as well as Canadian ports in Vancouver and elsewhere. The intent is to make doing so dramatically less expensive, despite a somewhat longer rail or highway transit to reach the American Heartland. But since less costly Mexican rail and truck firms would be employed instead of U.S. shippers, that cost would be minimized, stealing even more jobs from U.S. workers in those industries, to include air freight carriers, as well. They are apparently not done giving us the shafta with NAFTA and CAFTA, so they have to go afta more with a Canamex dissasta. 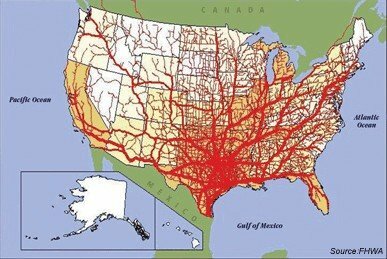 Yes, one is right to ask about the safety of U.S. highways with Mexican trucks driving non stop from deep within Mexico to the middle of the United States and beyond… since Mexican freight carriers are not subject to the same standards of safety in maintenance and operations as the United States. Oh sure, there is a lot of press coverage on how we are going to require tests and assurances, but that is to draw our attention away from the real issues. This was, in fact, the ONLY reason mainstream media talked about the President giving the green light to Mexican vehicles crossing the U.S. border without Custom’s inspection. Yes, you are right to ask how this will insure terrorists do not have an easier way to enter the country undetected. As I have detailed in my book, Fatal Rebirth, you can rent and direct a boxcar or tank car from anywhere in Mexico to anywhere in the U.S. with a laptop on the Internet. But the entire collective of all such issues are largely being ignored or, at best, given lip service by those pushing for Globalization and a One-World Government, one region at a time. Canamex is, and will be. Period. Take it or leave it. The country, that is. If you don’t want to become a global plantation worker aside your Mexican brethren, get out, now. The war against the lower classes by the one percent who control 90% of America’s wealth is not over. They don’t yet own the other ten percent. Canamex will help get it. There are three principle prongs in the Canamex Highway, but each fans out with alternates and secondaries, like so many rivers fed by creeks and streams. From Mexico through the MidWest States, the Mississippi River States, and the Eastern Seaboard States, and on into Canada. There is even a route along the Western Coast ‘to facilitate goods delivery to Mexico’ from those states. The Super Ports are nearly finished and already quite operational. And that is where perhaps the scariest elements of Canamex spring forth. The fear of loss of jobs, soverignty, highway safety, and border security aside, there is one fear no one has expressed. And that fear is become the backdrop for the new screenplay I am working on called Lion Dance. The scariest element to this author is that the Super Ports are being constructed by the Red Chinese in partnership with Mexican authorities and firms. Now, understand this: any partnership with the Red Chinese means partnership with the Red Chinese Army. All corporate business in China is at least 50% owned by the Red Chinese Army. Thus the Red Chinese Army is now in Mexico, at least in terms of logistics. Moreover, they are also in de facto control of both ends of the Panama canal. Logistics is about moving large amounts of material. In peacetime, that is goods, mail, and presents to Aunt Matilda. In war, it’s a bit damn sight more serious, transporting weapons, troops, food, medical supplies, and ammunition. It is what enables, drives, feeds, supports, and propels military adventure. If you do not have logistics, you cannot move an army or wage a war. If your logistics are poor, your army can be defeated by a lesser army if it has better logistics. So the first step in any war planning is to insure you have excellent logistics in place, and your planning must consider attacking the enemy’s logistics abilities. Canamex has no peer in this respect. It is pure logistics start to finish, and it has no weaknesses. Moreover, its logistics advantages are a two-edged sword, because they are also part and parcel of the very logistics required in defense of the United States. In a war with China, the U.S. looses those logistic resources, and finds them turned against them. No powerful seaports remain, no inbound supply in place, no relief ships in route, no access to the Panama Canal, a weakened trucking and rail industry, and as Lion Dance reveals, a very real potential for something far worse than even that. The people thrust into MTSR-7 and the mysteries they will encounter slowly reveal EXACTLY how Canamex can be used to easily invade and seize control of the United States almost overnight. A taught thriller with unexpected twists and revelations, it is 100% based on fact, and has nearly two decades of research behind it. How good was that research? It was the research for my book set, Fatal Rebirth (proparanoidpress.com), and was good enough to predict (in another screenplay published on my Web site in 1999) the downing of the World Trade Center by civilian airliners, resulting in a series of Middle East Oil Wars. It made other predictions correctly, too, including the above mentioned assassination attempt, and the North American Union well before the term was otherwise known. Thus one must ask if Lion Dance is mere fiction, or unfortunate prophesy? Time will tell. But the telling of the tale may itself serve to preempt such a possible future. The Chinese would dare not attempt it if the notion were to gain public scrutiny before the fact. That strategy didn’t work with the first screenplay with respect to September 11 attacks, but that screenplay was taken down early due to external pressure after only a few months of posting. Only one big name Hollywood producer had examined it, and he thought it an impossible scenario, and declined. We won’t name him as it would embarrass him with guilt, but he is as solid in Hollywood as a ‘rock.’ Who knows what history would have been if it had been left up and had gotten wide exposure, or picked up by a studio and put into production? Oh, I know you put a lot of stock into quick pitches, but that has to be delivered in person, because I dare not put the details on this page. It would give away the major plot twists, and potential for a sequel and prequel. Are three sentences High Profile enough for you? IMPORTANT: these are unverified reports. In fact, I am skeptical of some aspects, such as reports of 10,000 vehicles. An ability to count (as claimed) rows x vehicles is limited when at ground level (as claimed). One would need to be able to count, in best case scenario, 100 rows by 100 units per row. Either should stretch into the distance with reduced visual resolution to the point of loosing count well before 100. 100 vehicles would stretch a fifth of a mile. Can you count 100 cars down the road from an intersection? Can you even count 100 dashed lines on that road? I think not. In point of fact, one of the best ways to cover up an actual event is to stage fake reports about such an event which can later be shown false and discredited. Then when real reports do leak out, they, too, are thought to be fake. This is called the ‘straw man’ tactic in the 25 Rules of Disinformation. Posted on August 13, 2011, in Conspiracy, Entertainment, Political Commentary, Uncategorized and tagged Canamex, Lion dance, NAU, North American Union, People's Republic of China, Security and Prosperity Partnership, SPP, War with China. Bookmark the permalink. 1 Comment. There is a long list of reasons why, since discovering the ‘Amero’ (dollar) images, I’ve concluded them more likely fakes than not. To begin with, I’ve found there were three sets of images released to the same original source (Federal Jack). The first set contained typos, a big clue to being fake. The second set quickly replaced these AFTER the typos were pointed out (misspelled name). The third set contained the word SPECIMEN across each side of each bill (which is the proper way to treat non negotiable samples at the mint level). Additionally there are registration problems on the fronts of the bills (the same item is not in the same place on other denominations) but not on the back. The artwork employed is largely available on line, and similar funny money using such artwork has been used in other Web sites for other purposes (nothing as extensive or elaborate, however). Finally, additional photos were uncovered (all are found on my FB page in a single album) which show that the counterfeiting countermeasures involving special inks and watermarks, etc., which should appear differently at differing angles, do not – the bills therefore appear to be printed on regular paper with regular inks.